The Quilt Bliss retreat provides several swap opportunities, and in a moment of brief insanity I signed up for every single on of them -- a decision I later regretted (when prepping for them at the last minute) and then appreciated (when I was at retreat collecting my glorious swap goods). Let's start things off with my mystery friend, Angela Bacon. She described her favorite fabrics as, "Anything Denyse Schmidt!" and in other comments she added, "I am really loving mini quilts for my sewing wall." I decided to finally make use of the wide array of Chicopee fabrics I acquired in a Craftsy Freespirit Mystery Box. I cut triangles in short order using the AccuQuilt GO and AccuQuilt 3" Triangles In Square die. While there was admittedly more fabric waste, it was well-worth it in time savings, since I only wanted about four triangles from each fabric. I cut out an equal amount of solid cream triangles and arranged the shapes to gradate from cream to patterned blocks. The final shape ended up more table runner than mini quilt, but rather than backtracking, I decided to embrace the new direction. It was finished with an olive-green backing/binding and straight diagonal lines about 1/2" apart. Delivery was amusing. I put my packaged gift on the dresser of my shared queen bunk room as a reminder to myself to bring it upstairs after dinner and seek the aide of the staff in locating my secret pal. When I went back to my room, one of the girls inside reported to me that her secret friend was a major chicken, who just dropped off her present to the room without acknowledging who they were. A quick glance at the now-empty dresser revealed who my secret friend was after all. Well, that solved the delivery issue. I was well-pleased with what my secret friend, who turned out to be my car-pooling buddy, Melissa of My Fabric Relish, made for me. I had requested a Sew Together Bag since I would love one, but haven't mustered the guts to try my hand at it. (Bags are not my comfort zone.) Well, Melissa is a supreme bag-maker (and quilter, and little girl dress-maker) and delivered on my request in a supremely colorful fashion. I love it, and am quite sure if I didn't, throngs would line up to take it off my hands. But alas, I'm not giving it up. Just look at that dresden plate! That's right, work your angles, Sew Together Bag! The bundle of fat eights I acquired in the polka dot swap is a visual delight. My contribution was the white with mini gold dots (second from the top). I ordered a little too much. It turns out that shopping online late at night has its consequences. Then again, waiting until the last minute and trying to make accurate measurements while two very active preschool children keep you company, is also not a recommended course of action. As it turns out, if your five-year old is talking non-stop about his rendition of survivor, cutting at the 27", 18" and 9" mat marks can been overly mentally rigorous. That's when your improper allotment of dotty fabric seems really clever after all. I forgot to photograph the three fat quarters I submitted, but I am well-pleased with what I received in our White Elephant-style fat quarter swap. Small-scale animal prints cut into 10" squares were exchanged. I brought the turtles on the right. These cute woodland animals will make a fine quilt, but I want to pick something that will keep them fairly intact. I'm thrilled about my pouch swap acquisition. I must apologize for neglecting to photograph my pouch. I really thought I had taken a snapshot, so if I come across the lost photographic evidence, I'll let you know. It was complete in a peachy-pink floral, and bedazzled with sporadic Swarovski crystals in hopes of counteracting my unfamiliarity with pouch-making. In any event, we used a Jedi Craft Girl tutorial. After a fun game of swapping with those who shared specified characteristics ("If you have more than one sewing machine, come to the center and swap."Etc.) I came away a happy camper with this beauty, hand-embroidered and filled with special quilting treats by Nichole Christoffersen of Scribbles and Stitches. 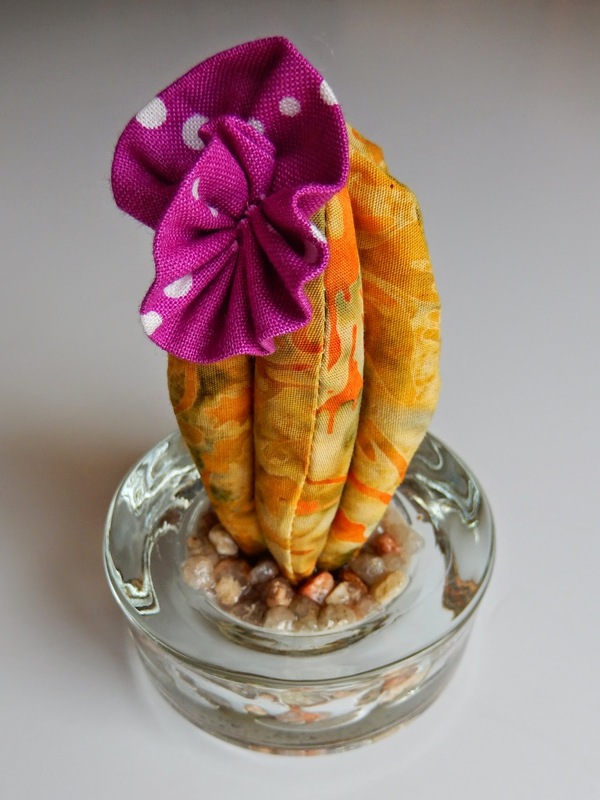 To give whoever received my pincushion a taste of local flora, I created a cactus pincushion using a tutorial at the Sewing Lab blog. I used a paper funnel and straw to pour crushed walnut shells (aka reptile bedding from the local pet store) into the top portion before stuffing with Poly-Fil. It would have been so much easier if I didn't sew so far down and/or if I had used a 1/4" seam and a shortened stitch length. I used a tea light holder from Target (Dollar Tree probably has some too.) and landscaping gravel from my garage to plant it. I used a funnel to gradually pour Mod Podge over the gravel into it barely covers the rocks in gluey whiteness. I thought it would never turn clear, but one day, weeks later, it did. However, if you use the less permeable walnut shells instead of pebbles, it'll only take a couple days to dry clear. In return, I acquired the most giggle-inducing pincushion. Unfortunately, I don't have information on his creator, but I assure you, I adore this little fella. I also found a free tutorial if you must simply have your own. On an unrelated note, I have some giveaway winners to announce. Kelly Wilson won the Wyndham mini charms and orange thread. Shannon Conley won the Cuddle Charms and thread. Pam Wisner won the Casablanca charm pack. 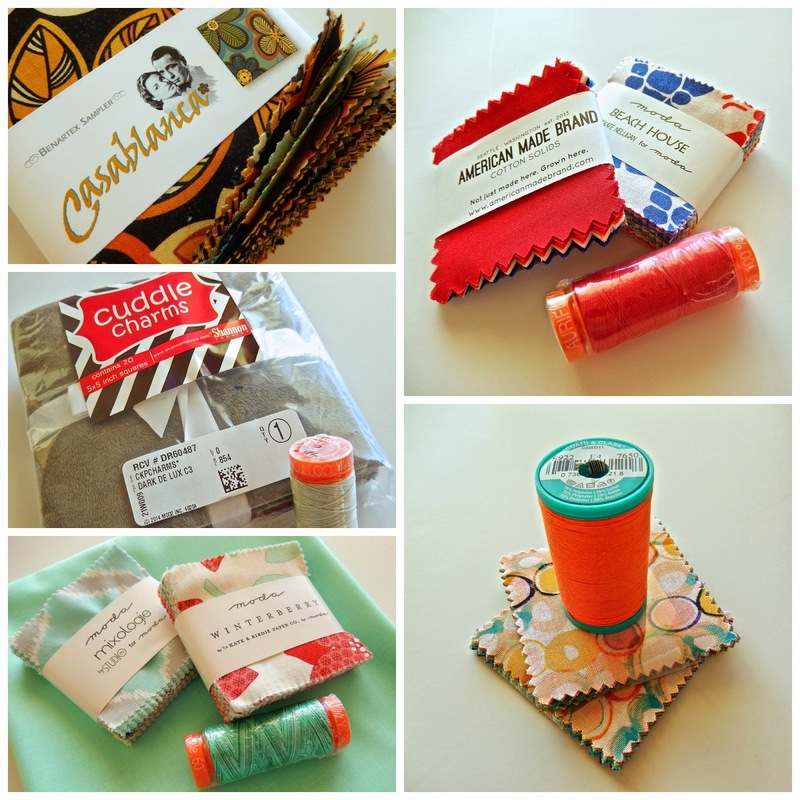 Sonja McLane won the batting, mini charm, thread, and solid fabric bundle. Caity Thurman won the AMB and Moda mini charms and thread. I just made three Sew Together Bags and mine look positively insipid next to your colourful beauty! 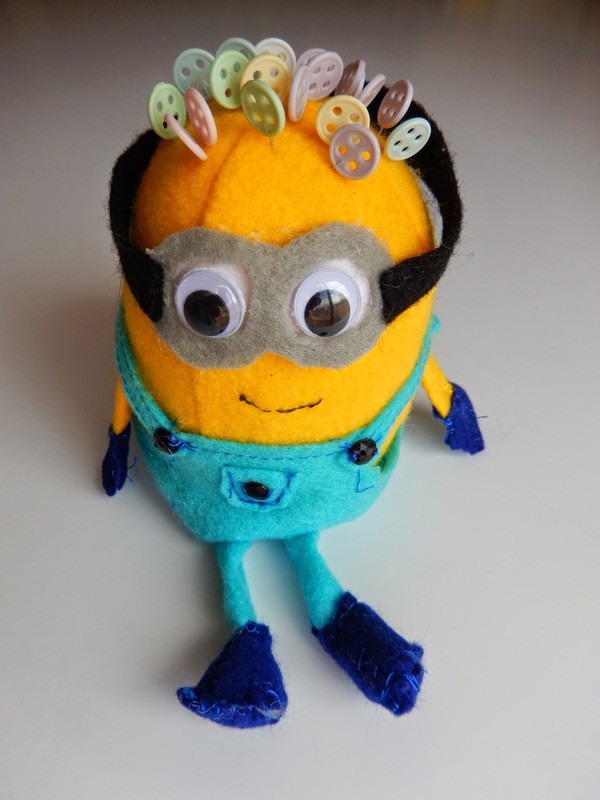 Poor Minion's head - it must hurt so! Oh my goodness. That sew together bag!!! So beautiful. Wow what a fun bunch of swap goodies! That cactus is super cute, glad the glue finally turned clear. I adore your sew together bag! I want one! I see you were kind enough to link to the pattern. Thank You! Fabulous - you did well there . Love the minion and the sew together bag is only gorgeous! Thank you so much for the giveaway! The charms arrived last week and I was going to send a thank you note but accidentally threw away the envelope with the return address. You're so sweet to share your cool things!